Although I’m no authority on world history, I think there are few who will dispute that World War I constitutes one of the greatest tragedies of the 20th century. While leading to the death of over 16 million soldiers and civilians, the “Great War” was awful for more than just its monstrous death toll. It also introduced a host of new and horrible ways for humans to kill and maim each other. 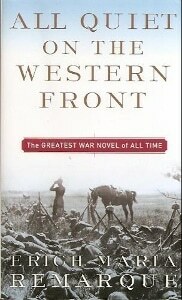 While much has been written of this war, All Quiet on the Western Front remains an undisputed classic of the war novel genre, effectively capturing the dreadful experience of life and death on the front lines. Despite the fact that I was well aware of the horrors that were trench warfare and mustard gas, I was surprised by how deeply this book affected me. 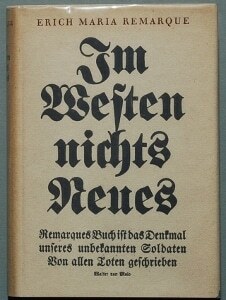 Written by German novelist Erich Maria Remarque, who fought in the trenches of northern France and Belgium in 1917, the book tells the story of Paul Baumer, a frail 19 year old who enlists with his classmates and quickly ends up on the Western Front, ill prepared for the horrors that await. Befriended by “Kat”, an older veteran who teaches him countless survival skills and frequently lightens the mood, Baumer describes the tedium and terror of trench warfare. The constant shelling, machine gun fire, stench of decay and well fed rats. There are no named battles and each day is pretty much like every other, as the mindless and repetitive skirmishes accomplish nothing. Death is a constant presence as Baumer witnesses the deaths of friends and enemies, finds himself stranded alone in no man’s land, and struggles to hold his mind and body together. Slowly, he realizes the futility of the war effort, when even a coveted trip home while on leave fails to rejuvenate his spirit. Published as a book in 1929, following its initial serialization in a German newspaper, the book was an instant worldwide bestseller. Its timing was perfect as the immediate horror and animosities of the war had abated and the public was ready to have a fresh look at the war. However, its negative portrayal of the war experience and its less than glowing descriptions of German soldiers resulted in it being enthusiastically banned and burned by the Nazis when they came to power in 1933. When it comes to describing the foul experience of trench warfare, Remarque doesn’t pull any punches, adeptly describing the terror with vivid and vile prose. At the same time Baumer’s reaction to these horrors becomes increasingly blunted as the book goes on, which serves to effectively reveal how the war works to slowly destroy him. While there are no heroics or happy endings here, Baumer’s humanity despite his lonely travails is portrayed with a sense of honor. I found the story to be a powerful and gut wrenching anti-war statement that affected me much more than I expected, given that it was published 85 years ago. It’s been a hundred years since World War I began and it would be nice to say that humanity has learned something about waging peace over that span of time. But given that waging war seems to be as popular as ever, books like All Quiet on the Western Front serve an important role, revealing what life is like for those who actually have to do the fighting. The novel stands the test of time as a classic of the genre and I recommend it highly, particularly for those who think they know what war is all about.